Offering you a complete choice of products which include optical weft straightener. The optical weftstraightener is composed of a reading bridge that, by means of sensors or reading heads, is able to detect the fabric weft distortions; ac­cording to this data it will regu­late bow and skew roller groups activity, in automatically, without any operator intervention needs. The machine can have several configurations with two main dif­ferences: MDC model and FDC model. - FDC model without driven bow roller, ideal for woven fabrics since they need higher tension. 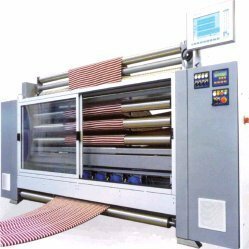 - MDC model with driven bow rollers for knitted fabric for a low­er tension. The system bianco SDD1 is com­posed of dedicated sensors, simi­lar to cameras and pulsating light sources, the number of which depends on the fabric width. Via dedicated mathematical algorithms, the system is able to detect the distortion of a lar­ge number of stripes or patterns on the fabric and to communi­cate with the correction system of weft straightening machines and/or implementation systems, in order to restore the required alignment. Its typical application is where the fabric weft is not readable or is preferable to align designs or lines in a periodic pattern of the weft. The high degree of automation achieved makes bianco SDD1 easy to use by operators, avoi­ding complex settings typical for other reading systems. Its versatility also allows some fle­xibility for adaptation to specific needs and fabrics.